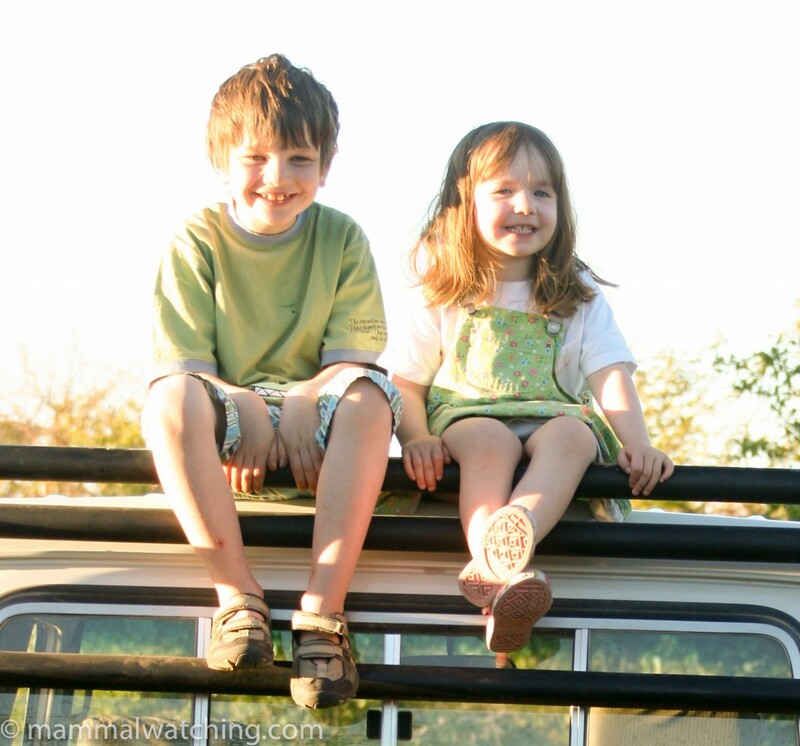 My first trip to Namibia was a family holiday, so I needed to try to fit mammal watching around two small children. I guess the trip was quite successful in that the kids enjoyed it and we also saw quite a few of the animals I was hoping for. Though of course had I been alone I would have visited some different places and probably seen a little more in my 9 days there. 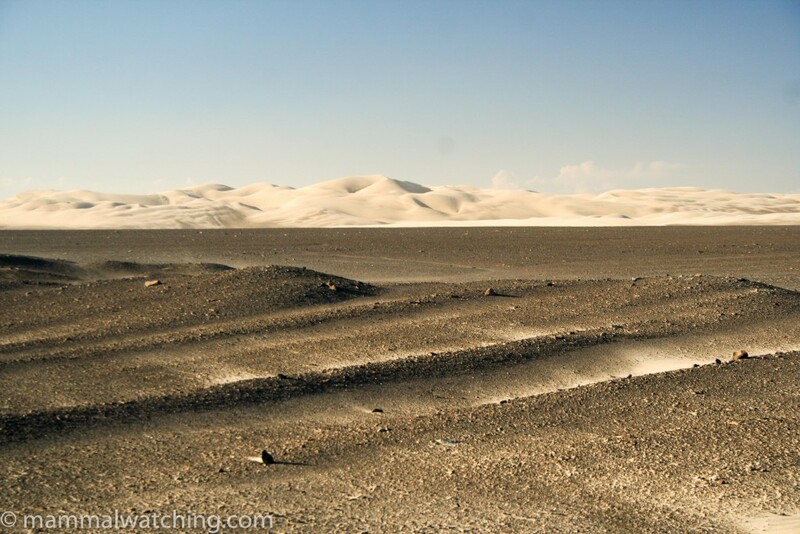 Namibia is large and wonderfully sparsely populated. It is an easy country to travel round, with friendly people, wonderful scenery, good roads, little crime and prolific wildlife. Accommodation can be quite expensive, especially when compared with neighbouring South Africa, though there are some fabulous places to say. 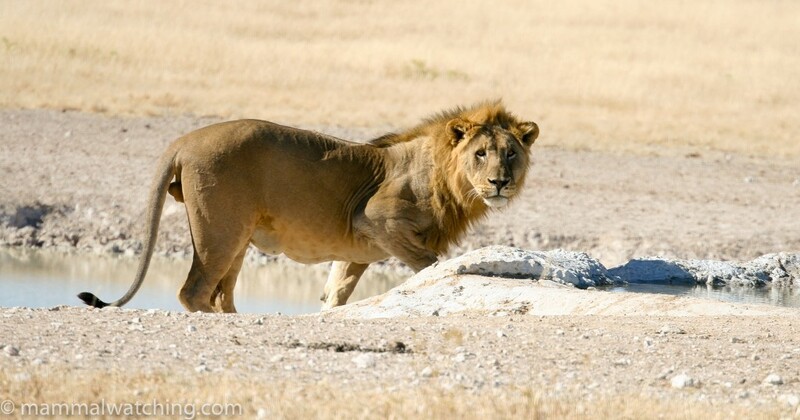 I went in May, early in the dry season and not the best season for game viewing: August through October – the end of the dry season – are the best months, at least in the north and centre of the country. 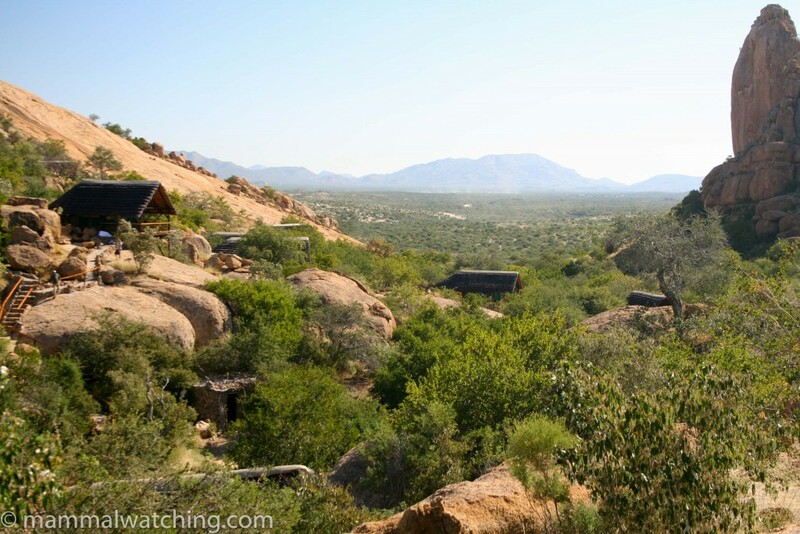 Erongo is a beautiful lodge, nestled among boulders on a rocky plateau. It is luxurious and the emphasis is more on the scenery and the food than the wildlife. Friends of mine had visited here and seen some nice stuff including Black Mongoose, Western Rock Elephant Shrew and Dassie Rat. Although Black Mongooses were regular in the dry season (when the lodge leaves out food scraps near the restaurant) they hadn’t been seen for several months. 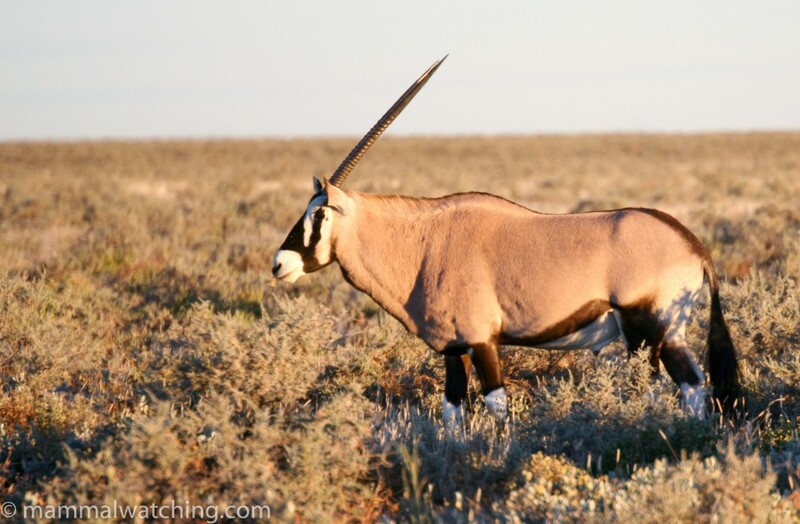 I was later told that the Erongo Mountains are the best places to look for this species. 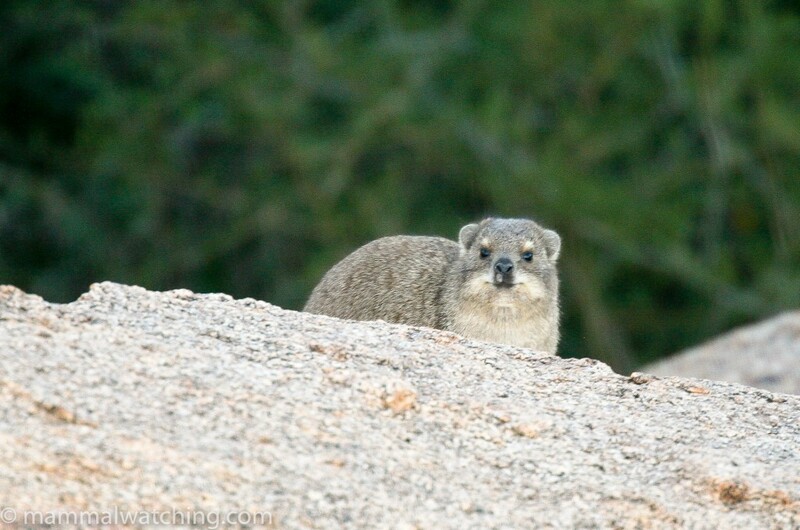 Rock Hyraxes are abundant around the lodge. 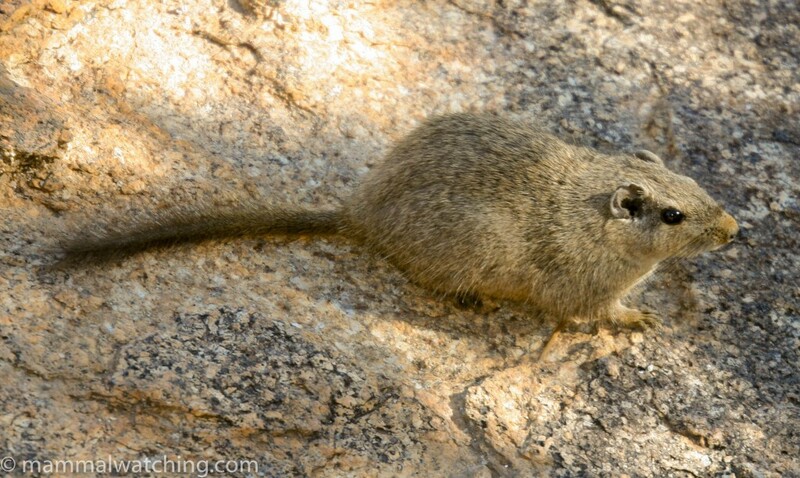 At 6am on the large boulders about 100m in front of the restaurant I saw a Western (Smith’s) Rock Elephant Shrew – another animal apparently lives closer to the restaurant and is frequently seen though not by me. At about 7.30am the first Dassie Rat appeared near the restaurant, scampering around the rocks under the balcony. A very cool beast. 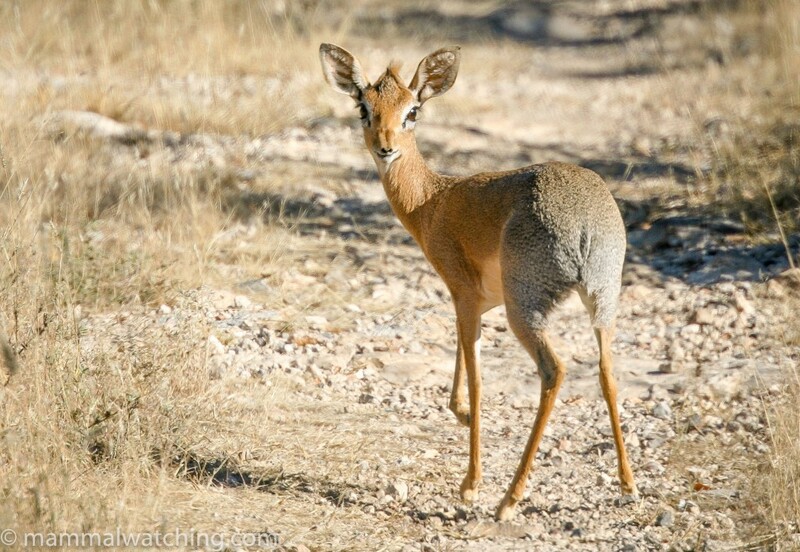 An hour later a pair of Damara (Kirk’s) Dik-Diks were at the waterhole in front of the restaurant. Chacma Baboons were common in the concession. Game viewing is pretty sparse in May, but we took an afternoon drive to Paula’s Cave, a Bushman rock art site. It was clear that bats were using the cave, but I suppose primarily as a night roost, because there was none in there. On the way back in the dark I stuck the spotlight on and saw an African Wild Cat in a dry river bed, several groups of Kudu, a couple of Cape Hares and a Small Spotted Genet (either G. genetta or G. felina but i wouldn’t swear to which) near camp. The driver was quite impressed with the amount we had seen. 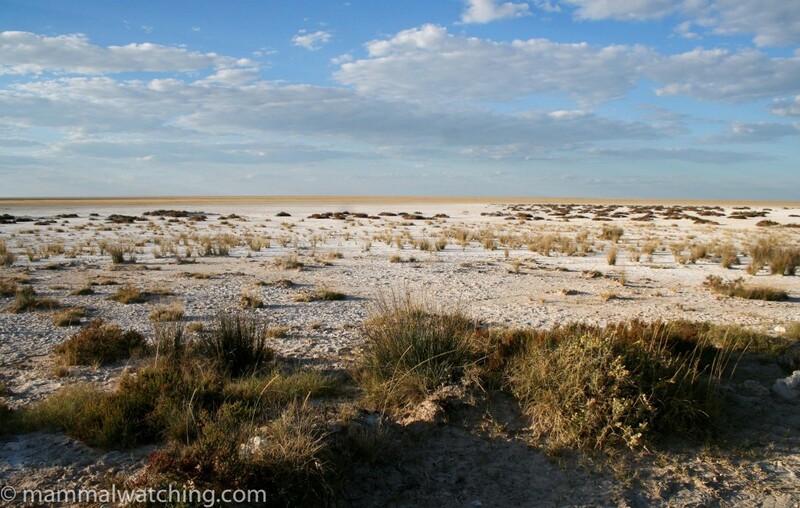 Etosha is one of Africa’s finest national parks and certainly one of the most impressive I’ve been to. I stayed at the Okaukeujo Rest Camp, the main HQ of the park. It was not a particularly attractive camp, and quite large and busy, but it was pleasant enough. 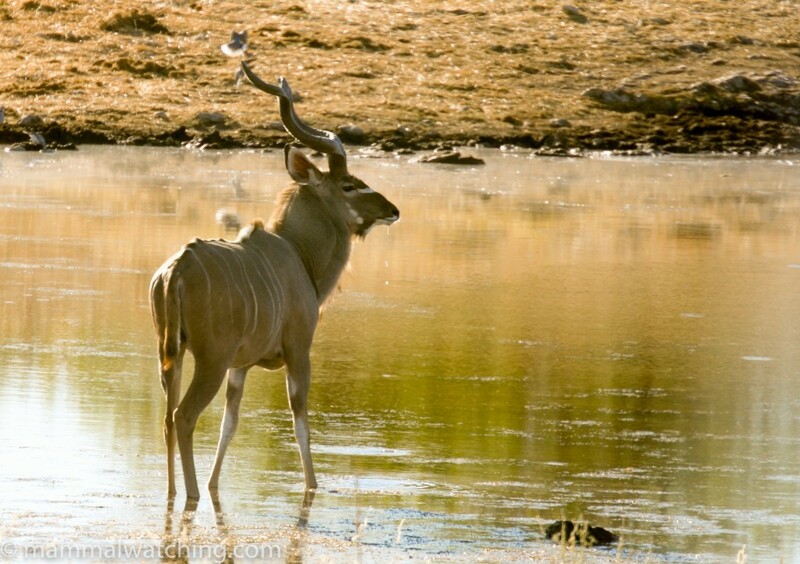 Its main attraction is the floodlit waterhole which attracts a good amount of game. Although the camp felt quite crowded, the national park wasn’t. 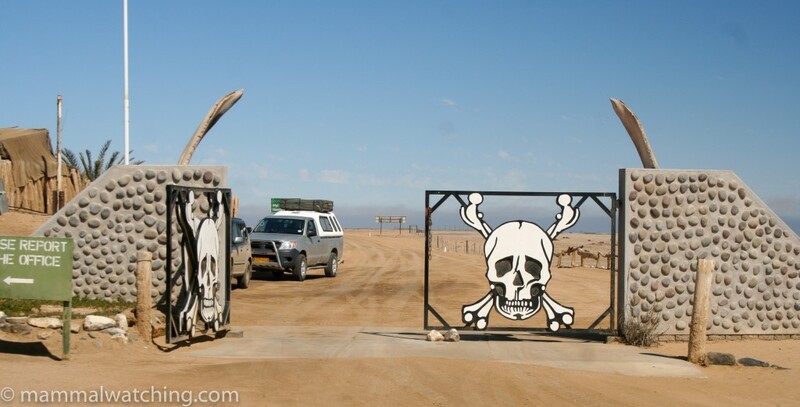 There is no problem taking your own vehicle into the park between sunrise and sunset but night drives are not allowed on your own (3 hour night drives were available at the camp). 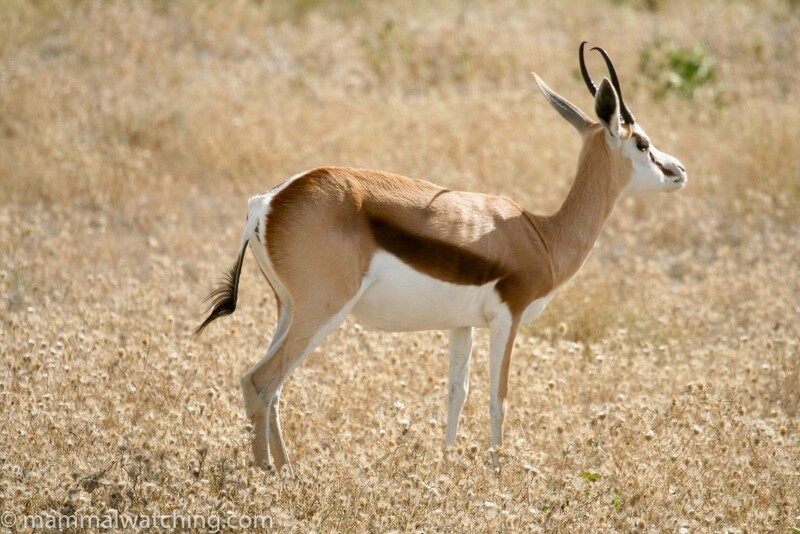 Springbok, Gemsbok and Burchell’s Zebra were very common, interspersed with smaller numbers of Blue Wildebeest. 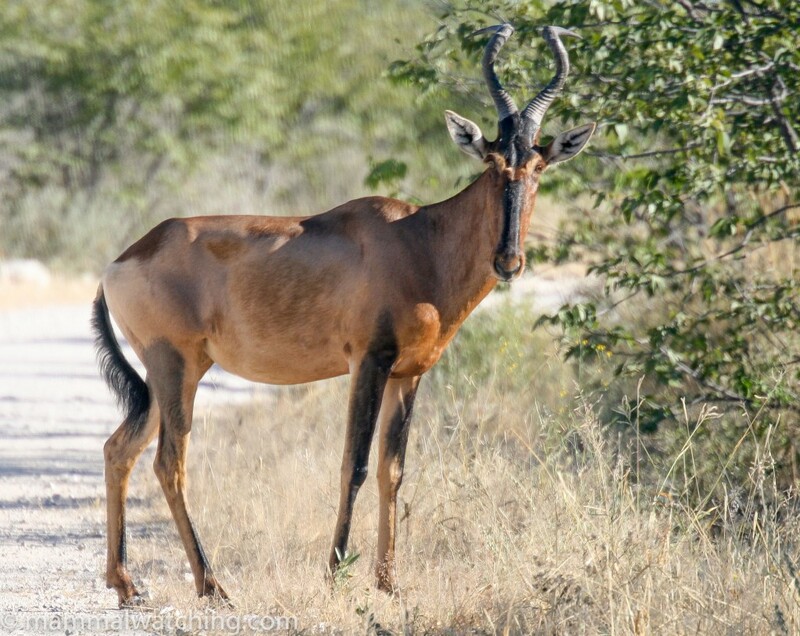 In the woodlands around the Aus waterhole Black-faced Impala were the dominant ungulate with a few Steenbok, Red Hartebeest and Kudus. 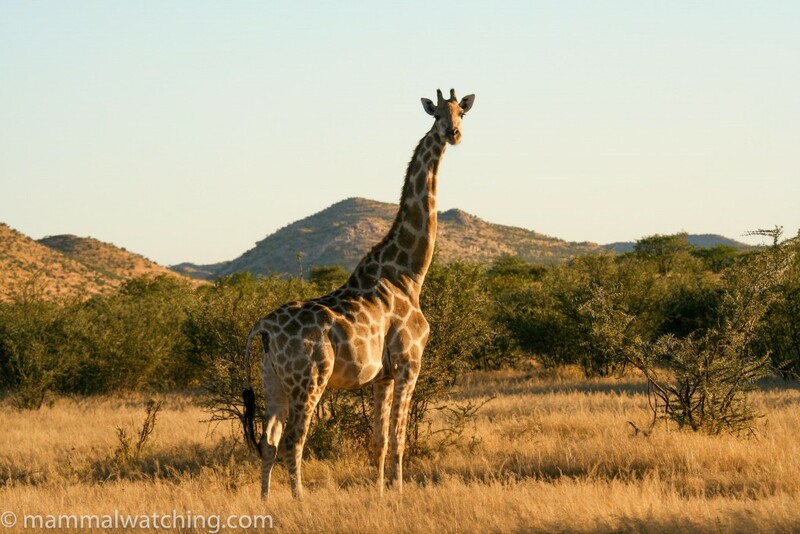 Giraffes were fairly easy to see close to Okaukeujo camp, and there were four Lions at the Nebrowni waterhole on every drive. I saw one Cape Fox and a Yellow Mongoose near Okakeujo: the road from Okaukuejo to Okondeker is apparently the best place to see Cape Foxes. 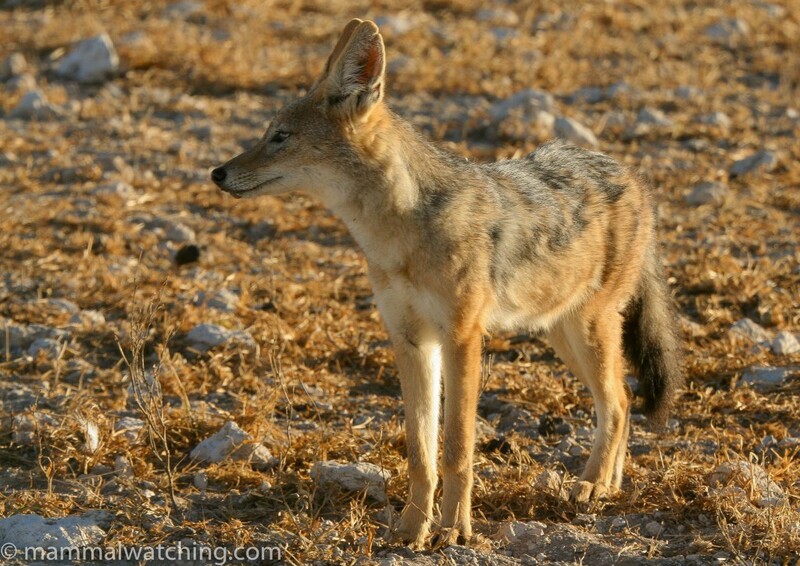 Black-backed Jackals were common within the campground and around the waterholes: I squeaked one Jackal right up to the car. 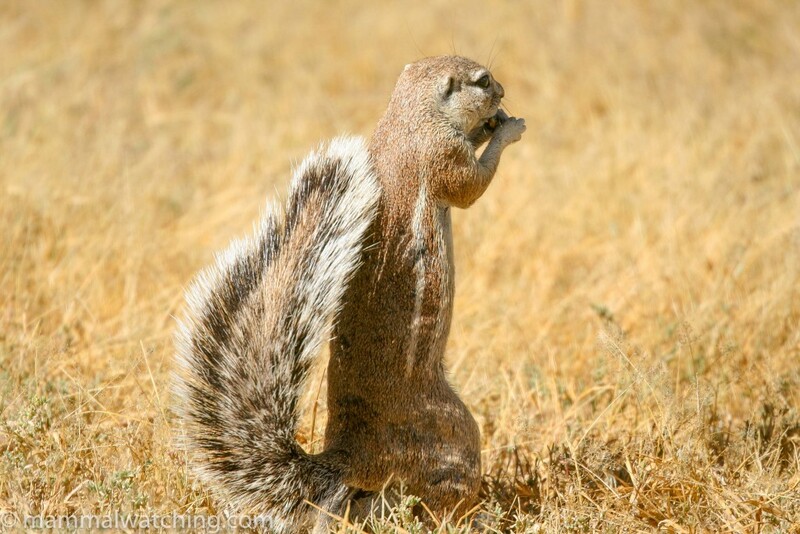 South African Ground Squirrels were common in the campground in the day. 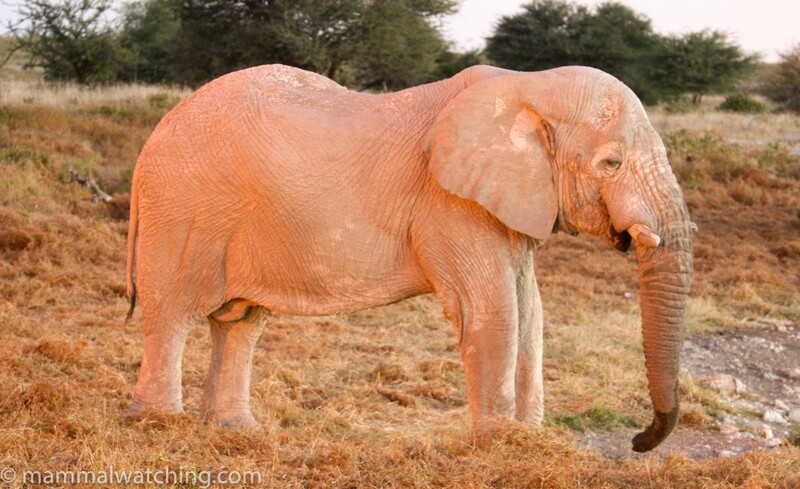 There were several Black Rhinos at the Okakeujo waterhole during the first evening, and they were joined by a pair of White Rhinos and an Elephant during my second evening there. An African Wild Cat was hunting along the fence at the water hole too. I took one of the organised night drives. It was not very good. The guy driving was also holding the spotlight which wasn’t optimal. Moreover he had a red filter on the light the whole time. Maybe this is a park rule or maybe his personal preference but it didn’t help us find animals I reckon (red filters are fine once you get onto something but I don’t think they are very helpful for finding things). During three cold hours we didn’t see a great deal of interest other than a few Spotted Hyenas and a couple of Lions sleeping at a waterhole. 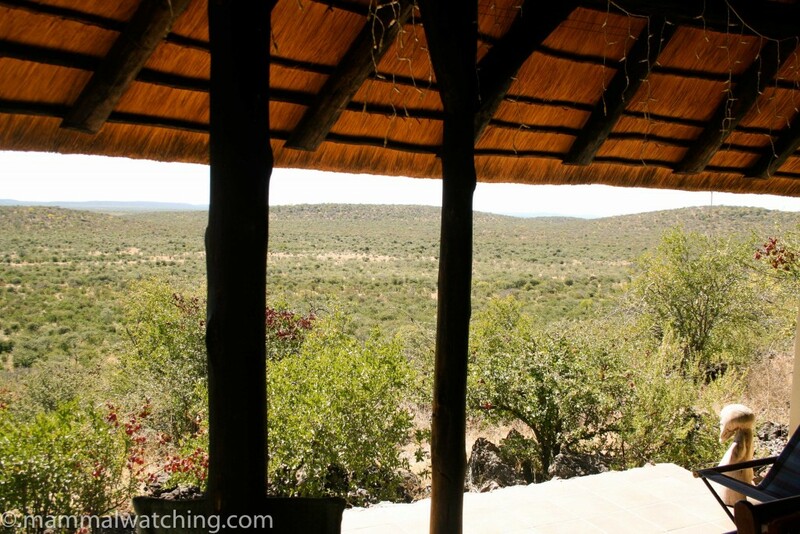 Tandala Ridge, is an understated sort of a place, a small camp (just two bungalows) overlooking a waterhole on a game farm about an hour south-west of Okaukeujo. 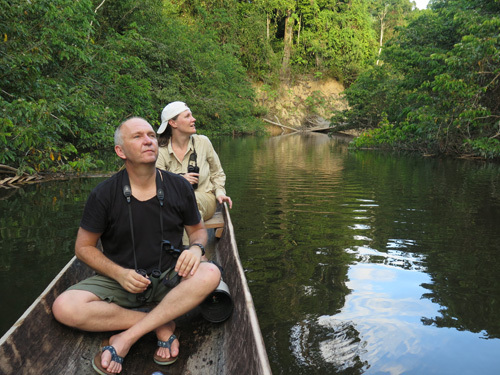 It is run by Tim and Laurel Osborne, two professional biologists who have retired here. Tim has discovered a new species of Rock Mouse and a Rock Agama on the property so of course both he and Laurel were clued up on where to see the mammals. 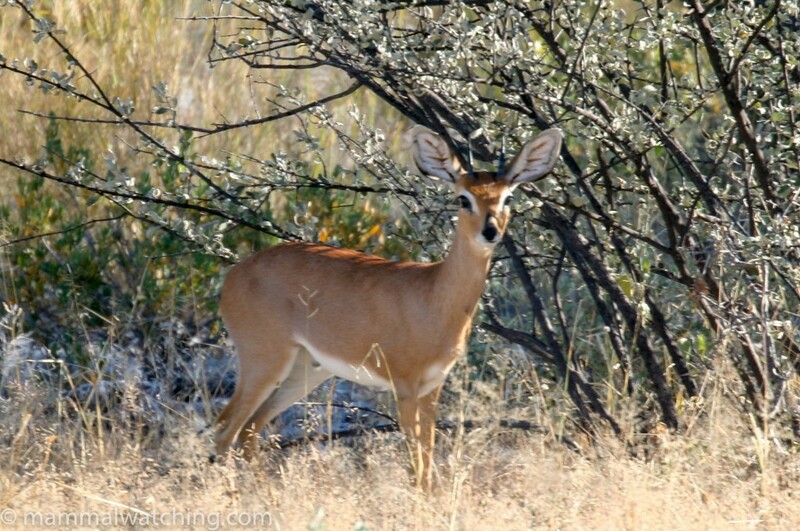 Kudu and the first Warthogs of the trip were common, and Tim easily found some Damara (Kirk’s) Dik-Diks (which I’d missed in Etosha and seen only fleetingly at Erongo). 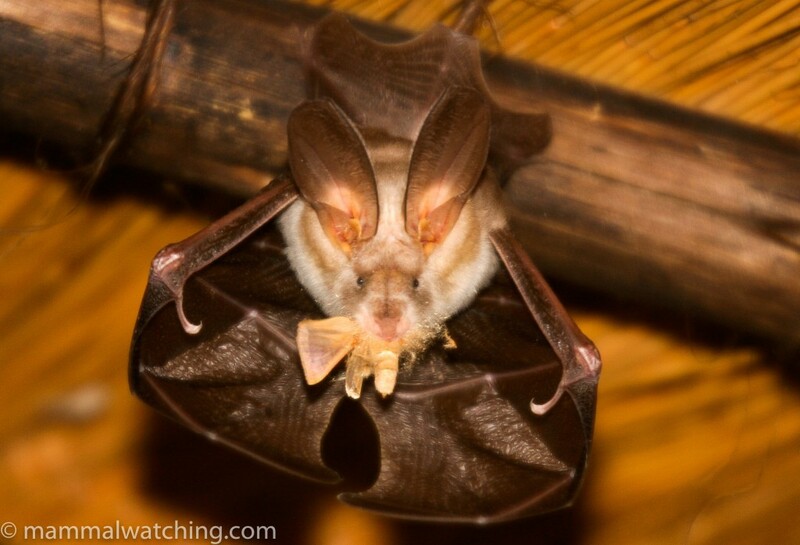 Egyptian Slit Faced Bats (Nycteris thebaica) were around the camp at night using the netting in the porches as a feeding roost. There were Dormice living in the camp buildings. I saw the first on the fly screen of my door and it proceeded to crawl into bed with during the night, much to my kids’ delight. Tim had caught a few over the years. I think this must be a Stone Dormouse (Grqphiurus rupicola). 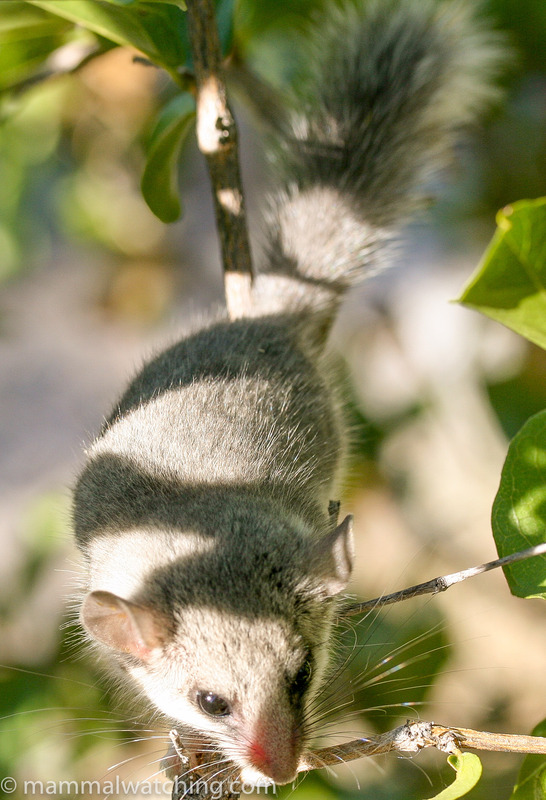 The are also rather similar looking to Noack’s Dormouse (Graphiurus microtis) though from what I can tell this species is just out of range at Tandala. I set a few Sherman small mammal traps around the camp and caught a Namaqua Rock Mouse and Stone Dormouse, both in the woodpile. Tim and I spent 3 hours scrambling around the needle sharp rocks looking for Jameson’s Rock Rabbits. We found plenty of latrine sites but no rabbits. We also saw a few Kaokeveld Rock Dassie’s (Procavia capensis welwiitschii) which was formerly thought to be a species in its own right, but is now generally considered a subspecies now of P. capensis. We also spent time looking for Round-eared Elephant Shrews which live on the property. They hang out in thickets of Cataphraxis (a grey-green shrub that looks to my unbotanical eye quite like Australian saltbush). Again we were unlucky: we found a few runs but didn’t flush any animals. 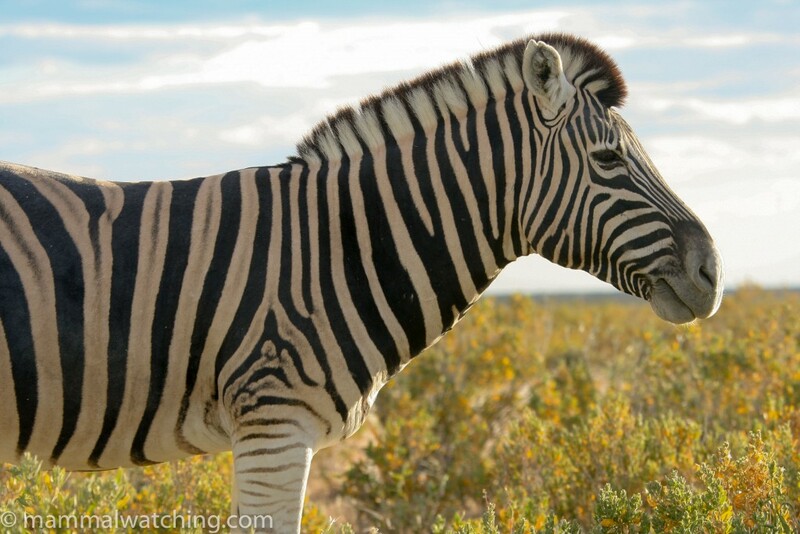 Hobatere Lodge is another great spot to stay – Namibia has, it seems, more than its fare share of luxurious – without being over the top – bush lodges. Hobatere is run by Steve and Louise Braine, well known Namibian naturalists, who were very helpful on where to find stuff. 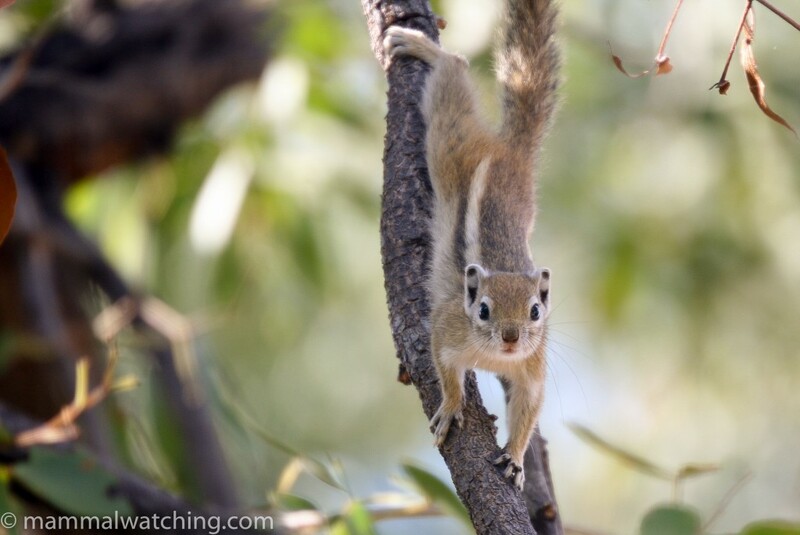 Steve confirmed that the Ground Squirrel I had seen crossing the track into camp (about 5 km from the lodge) was a Mountain Ground Squirrel (Xerus princeps) – it was alone and in a rocky outcrop so the habitat was right. We spotted a Klipspringer on the way in too. 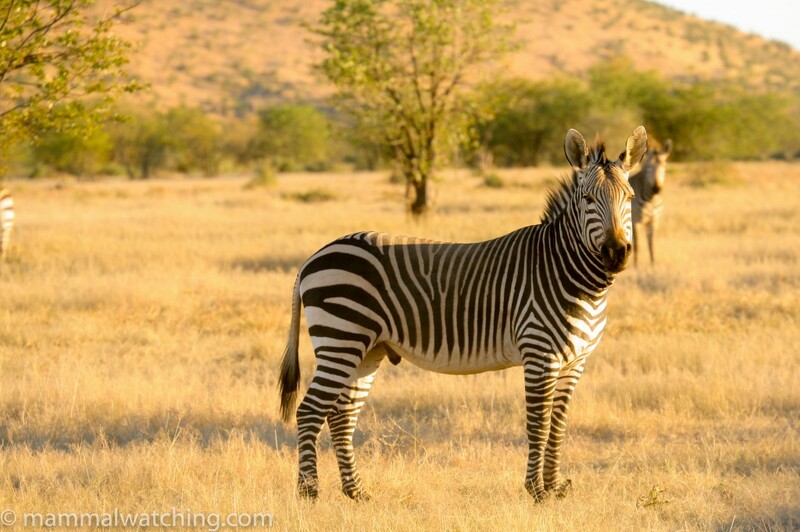 An afternoon game drive produced many Hartmann’s Mountain Zebras, Springboks, and Gemsboks as well as a few Giraffes and Black-backed Jackals. I drove down the track towards the gate in the evening for 45 minutes with my spotlight and saw a Cape Hare, an African Wildcat and a Cape Fox along the way. Hobatere Campsite is back on the main road (about 1km before the turn off to the lodge) and is a good spot for Jameson’s Rock Rabbits and Black Mongooses. A PhD student from the University of Queensland was radio tracking Black Mongooses there and so I visited at dawn the following day and spotted her as she was leaving camp. I wasn’t able to arrange to help check the traps or radio-track but she did advise that the mongooses were shy and the best bet of seeing one there was to sit quietly from a vantage point. 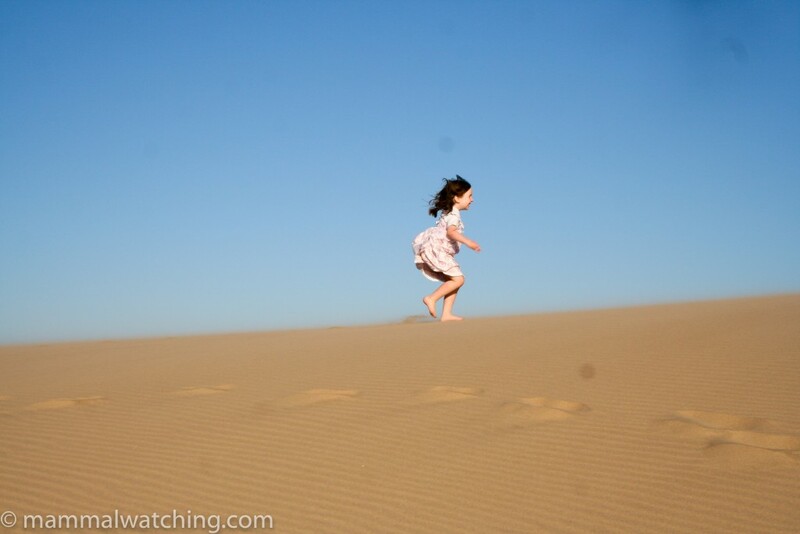 She reckoned they were easier to see in the Erongo Mountains. Jameson’s Rock Rabbits were easier to find, and I saw one sitting on a rock on the ridge that runs east-west just 100m west of the camp site. 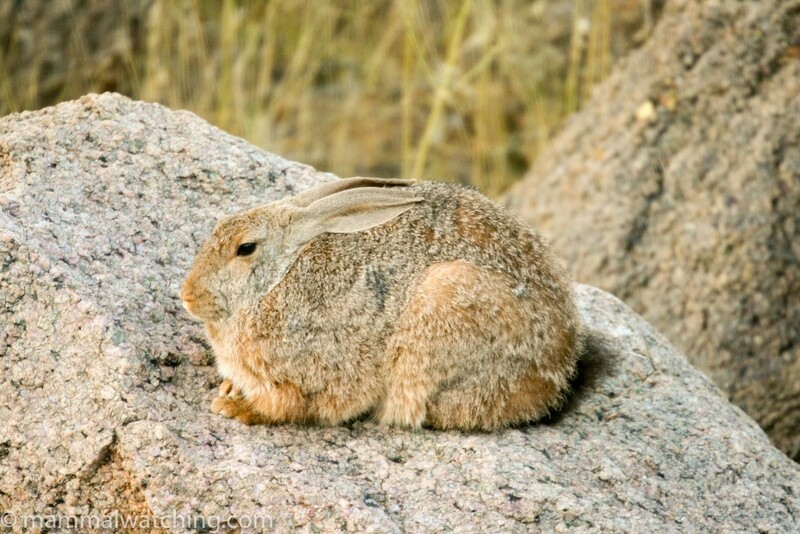 It took me half an hour to find a latrine site and I saw the rabbit a few seconds later sitting on a boulder at 7am. I got to within 10 metres before it hared off. I also saw three Klipspringers in camp at dawn. Back at the lodge I waited until after breakfast to see a Striped Tree Squirrel (a.k.a Congo Rope Squirrel) that are common in the lodge gardens. 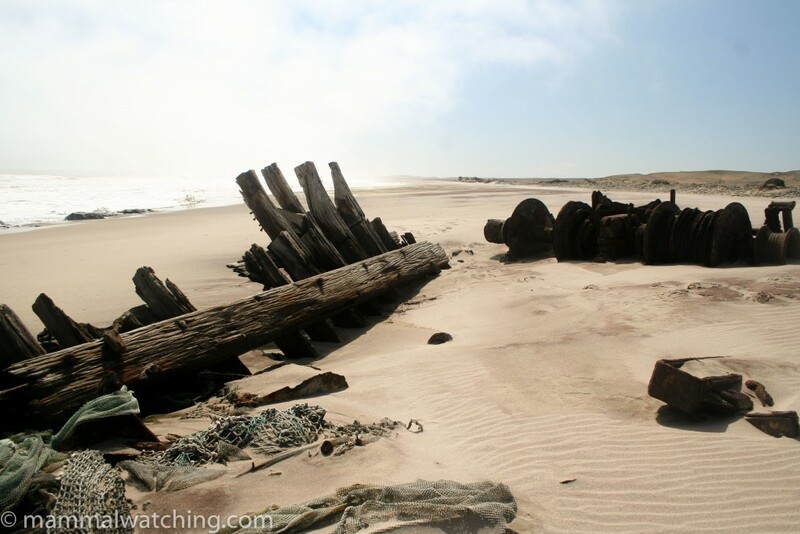 Terrace Bay at the end of the public road north along the Skeleton Coast feels damn near like the end of the earth. It is a starkly beautiful place with a comfortable if expensive government-run rest camp. 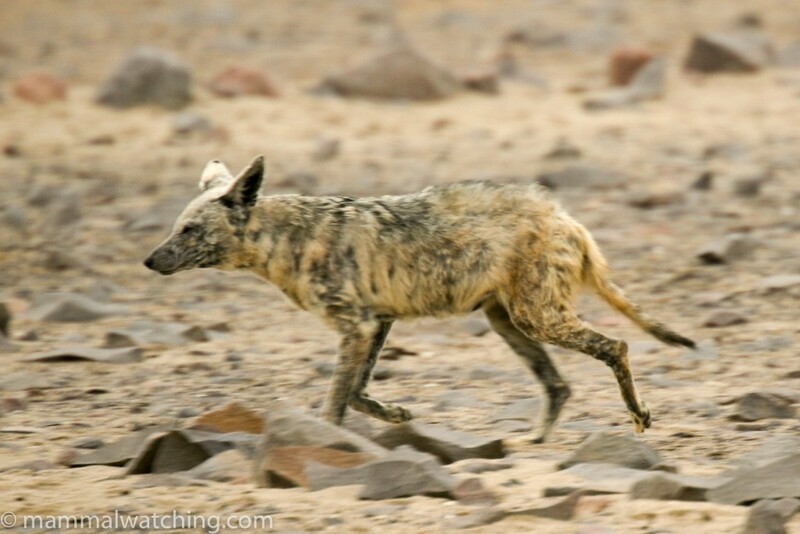 It is also a good spot for Brown Hyenas, an animal that I wanted to see in Namibia more than any other. 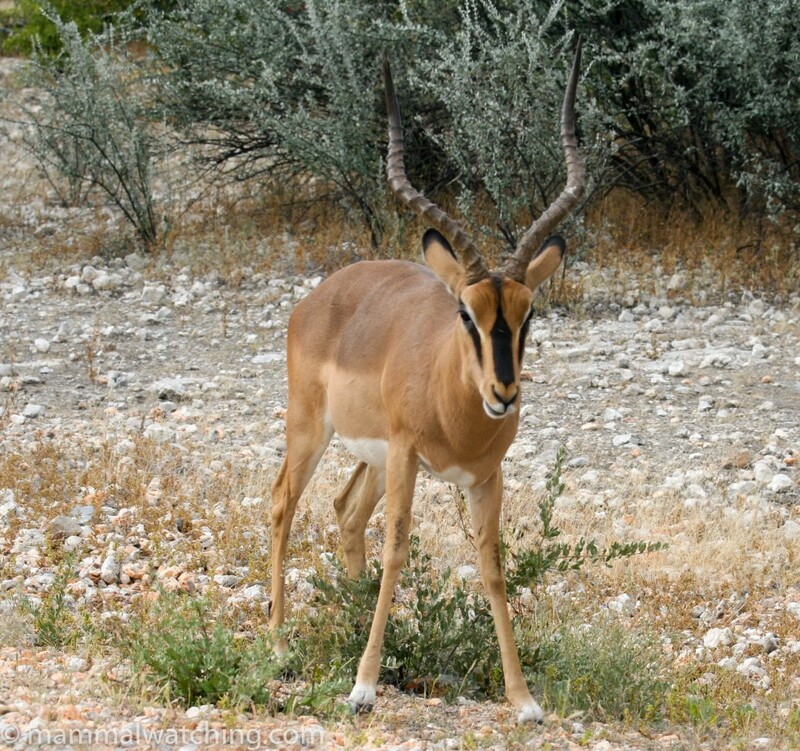 On the way in to Terrace Bay from Hobatere we saw a few Gemsbok and Springbok, both in the desert and along the coast, and there were some Black-backed Jackals around camp. Hyenas could be anywhere I was told, and were regularly seen in the camp at night. The fish cleaning station there was a good spot to look. I took a drive south along the road at 9 p.m. and was stopped 20 minutes later by two rangers. I got my permit. They searched for the “no driving at night clause”. There wasn’t one. They let me off with a warning. I spent the next couple of hours cruising around the campsite but no Brown Hyenas, and none the next morning when I left at 6 a.m. for another look. 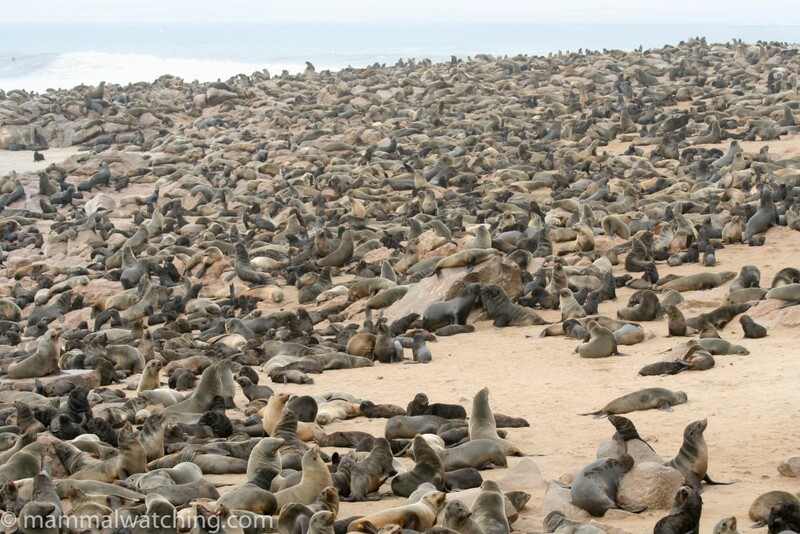 The Cape Cross seal colony is another good Hyena location where the local population feeds on pups from the 100,000 strong South African Fur Seal colony. The colony is an impressive spectacle but unfortunately its only open between 10 a.m. and 5 p.m. so Hyena spotting is unlikely. There were several Jackals around at 3 p.m. including one with mange that looked uncannily like what I thought a young Brown Hyena might look like. Wishful thinking…. 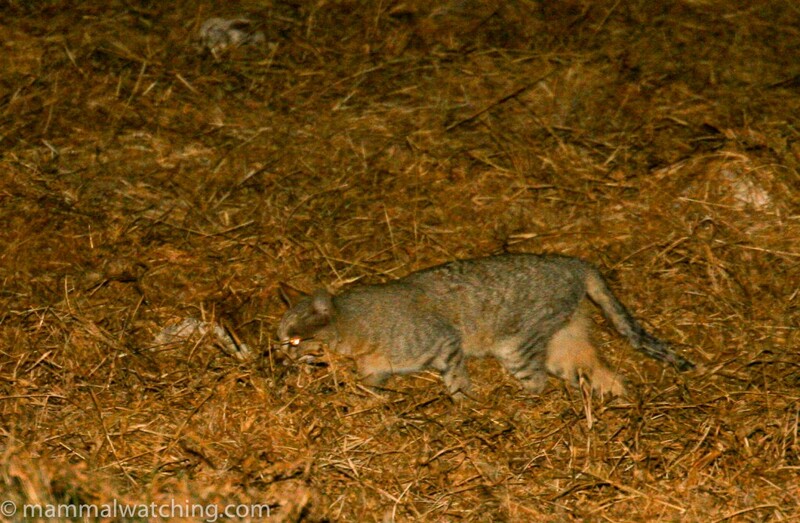 The image also shows how Dingos, dogs or foxes might easily be transformed into Thylacines. Mangey Black-backed Jackal, Canis mesomelas, does a Brown Hyena impression. 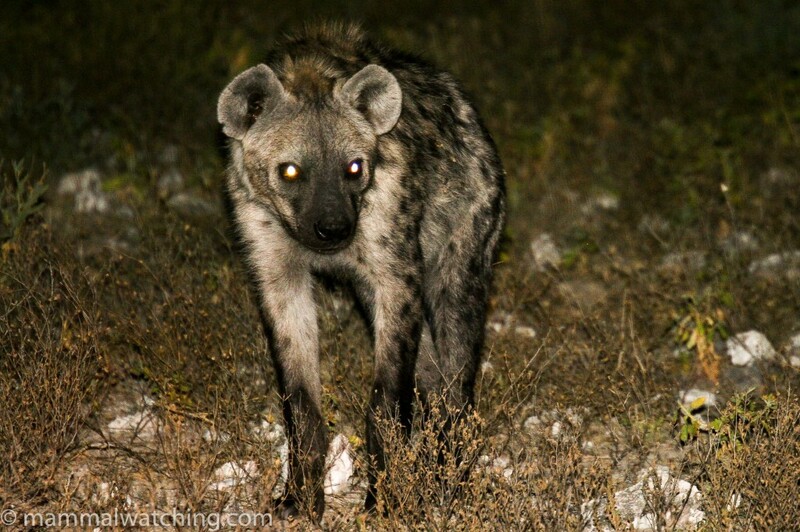 I spent several hours spotlighting in a last ditch effort for a Hyena. A dead Fin Whale was on the beach at Jakkalsputz, just south of Henties Bay. It was smelling pretty ripe – and getting riper by the day – while the harbour authority and national parks argued over who was supposed to dispose of it. But there was nothing feeding on it. I saw a few Jackals there and more back at Cape Cross, and also a Hairy-footed Gerbil on the beach at Jackkalsputz. I deliberately did not set my expectations too high for this trip given the kids were with me. A Brown Hyena would have been great, but I needed to spend a couple of extra nights on the Skeleton Coast to have had more of a chance I think. Black Mongooses are often seen in the Erongo Mountains, and would have been nice. 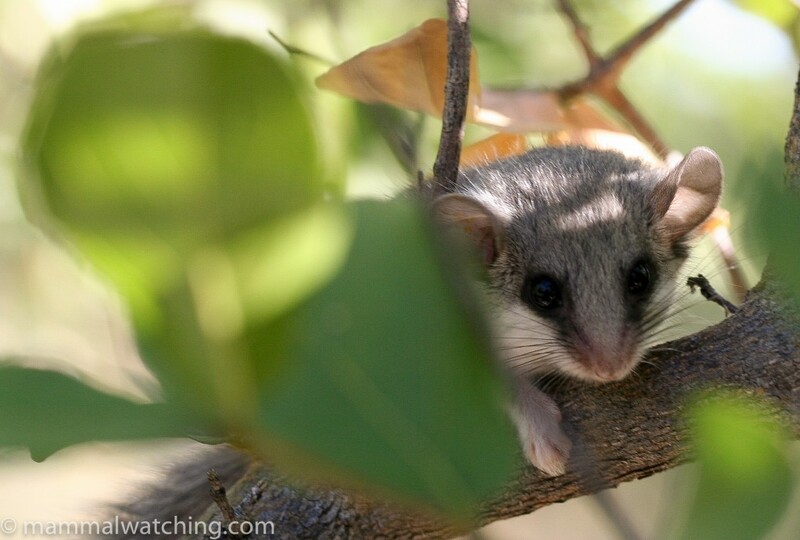 The Round-eared Elephant Shrews at Tandala are findable and others have reported Commerson’s Leaf-nosed Bats from several locations, while Trevor Hardaker saw the endemic Seltzer’s Gerbil inland from Swakopmund. Heaviside’s Dolphins are easy to see around Walvis Bay on organised dolphin watching trips. 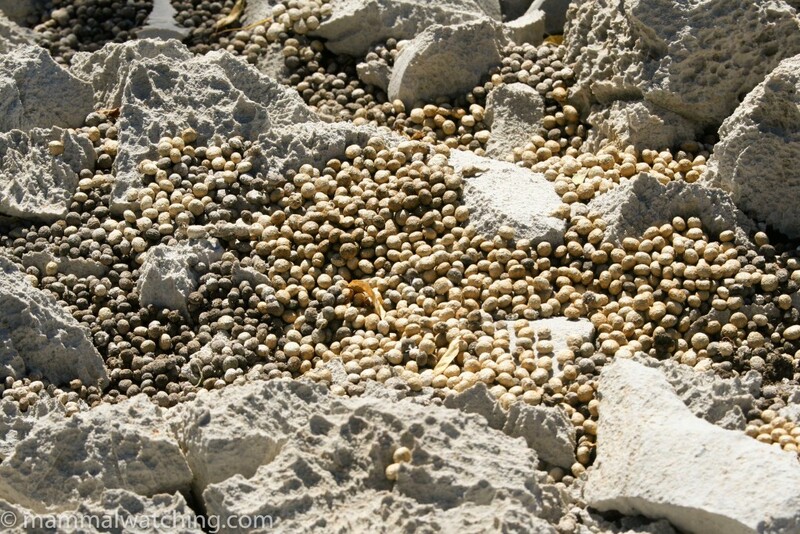 Finally, its worth looking under the bridge at Swakopmund for Littledale’s Whistling Rats. I didn’t get there. But if you are in the area there was also another larger colony north of town. There are Brandt’s Whistling Rats in the area too on the harder ground.